Techpoint.ng will be organizing its startup-targeted event tagged Techpoint Build to support entrepreneurs as they weather the storms of starting up and sustaining a business, this would be achieved in four core agendas; conference exhibition, pitch storm and Startup/ SME clinic. There would also be opportunities for exhibiting products. The Event will connect participants with professionals who will provide expert guidance in technical, legal and marketing aspects. It is open to investors, startups, small business owners, hardware/software professionals, lawyers, business developers, policy makers, accountants and other key players in the startup and tech sector across Nigeria. 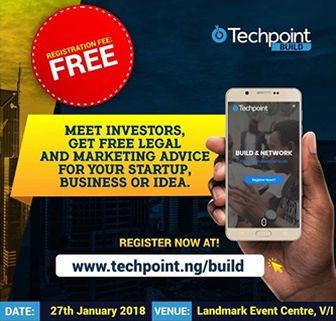 Techpoint Build will be held on the 27th, January 2018 at Landmark Event Centre, Victoria Island Lagos, Nigeria. The best part is that it is free and open to startups from diverse industries. Book a seat by registering here. Event early stage startup, entrepreneurship, Funding, Nigeria. permalink. Genesys IGNITE is hosting an event to support Startups in Southeast Nigeria.